Could A Cheap, Simple Medication Head Off A Heart Attack? : Shots - Health News Harry Selker has spent his life trying to come up with better ways to keep people from dying of heart attacks. Now he's intent on figuring out if a simple, cheap medication could be a game changer. 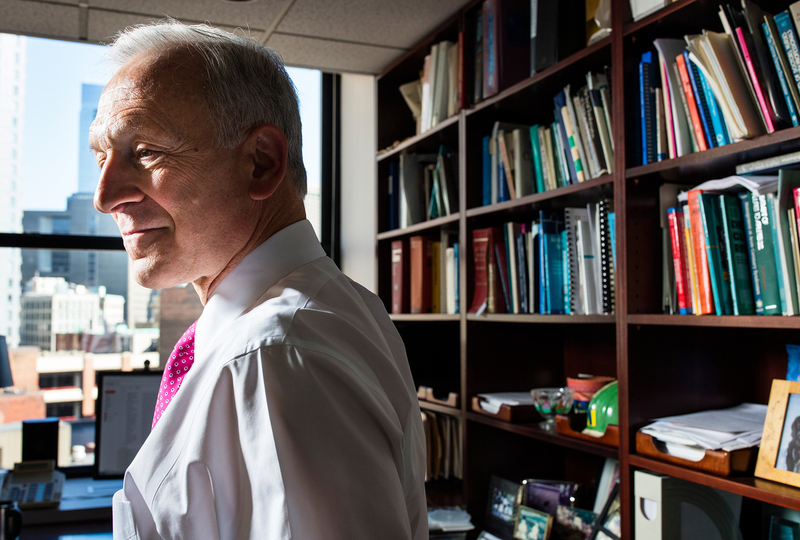 Dr. Harry Selker, a cardiologist, works on collaborations to improve delivery of medical care. When Harry Selker was working as a cardiologist in the 1970s, clot-busting drugs were showing great promise against heart attacks. But their lifesaving properties were very time sensitive. "If you give it within the first hour it has a 47 percent reduction of mortality; if you wait another hour, it has a 28 percent reduction; another hour, 23 percent. And people were taking about 90 minutes to make that decision," he recalls. "So they were losing the opportunity to save patients' lives." Selker envisioned a predictive tool, a kind of calculator that would help make the decision faster. He knew the data to create such a tool were already out there, from research on drugs that dissolve blood clots. "We made mathematical models and they kind of represented that comparison from those data, and that helped us make these predictive instruments. We built them into electrocardiograms," Selker says. That helped physicians make better decisions. The EKG-based predictive instruments have helped doctors prescribe clotbusters within the hour, increasing the use of the therapy within one hour, and getting more people treated with either clotbusting drugs or angioplasty. 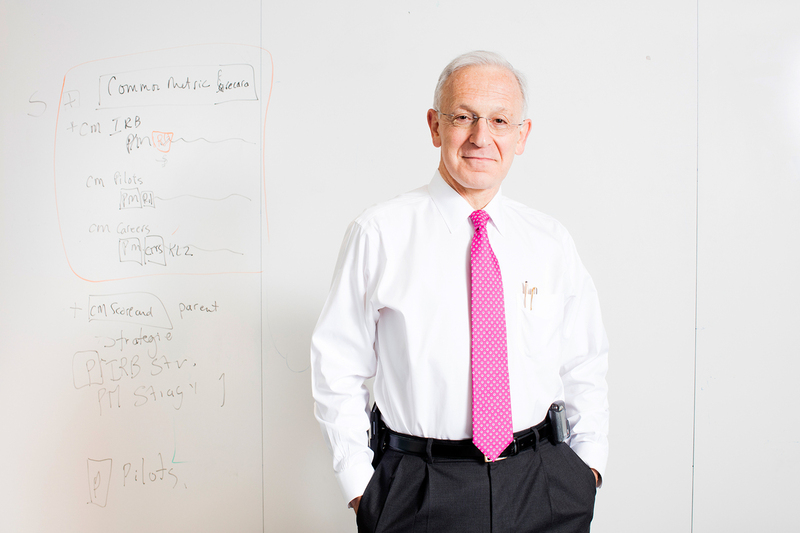 Building on this success, Selker and colleagues at the Institute for Clinical Research and Health Policy Studies at Tufts Medical Center in Boston, where he is executive director, have gone on to develop other predictive tools, in areas from knee replacement therapy to opioid addiction treatment. Selker grew up in a household in the Seattle area where he was encouraged to tinker. In his office, he proudly shows off the first automobile shock absorber, invented by his grandfather. And while Selker's own list of patents will attest to his passion for innovation, he's equally passionate about working to ensure those innovations will have an impact. One medical treatment Selker is pursuing right now has never delivered on its early promise for saving lives. It's a cocktail of glucose, insulin and potassium, known by its chemical initials GIK. In studies with baboons and rabbits more than 50 years ago, GIK seemed to actually prevent heart attacks. "They would clamp off these coronary arteries simulating coronary thrombosis, but keep infusing them with glucose and insulin, then potassium," Selker says. When the researchers unclamped the arteries, they found no signs of cardiac arrest, as would be expected. The simple concoction had protected heart muscles against damage. Selker says: "So it was very encouraging. It was extraordinary, really." But there was a problem in translation: In human studies, GIK didn't seem to do much of anything to prevent heart attacks or damage. The research sat on the shelf. But when Selker learned about the research from a colleague and they started to discuss it, he became convinced there were fatal flaws in the human studies, including administering the GIK too late to have an effect. Selker and his colleagues designed a study to test GIK in humans. Paramedics in 13 cities gave people who appeared to be having a heart attack either GIK or a placebo. The GIK didn't keep people from having heart attacks, but those given it were less likely to suffer cardiac arrest or death in the hospital. It also reduced the amount of heart damage by 80 percent. The results were published in JAMA in 2012. Selker is testing whether a simple, cheap combination of three drugs can help reduce the damage caused by a heart attack. Selker says that if additional research supports these findings, many lives could be saved with a simple therapy that costs less than a hundred bucks. But he soon discovered that knowing what needed to be done wasn't enough. "I thought, pretty much, my work was done and people call me up and say you know, 'when would we get this GIK stuff?' And I realized nobody's making it, nobody's selling it. And so I started talking to the pharmaceutical companies saying, 'You know, would you make this stuff?' And they basically weren't interested." GIK is a cocktail of existing off-the-shelf ingredients. A company could invest in the additional research and work to get it out to patients, but there'd be no big payoff. But Selker refuses to be deterred. He is now in dialogue with the Food and Drug Administration about the details of a definitive clinical trial to determine the effectiveness of GIK in acute coronary emergencies. And like so many times before, he's continuing to reach across professional boundaries, working with policy experts, statistical modelers, anyone who can push the process forward. "If you're going to try to improve things, you have to work on all angles, you have to work in all disciplines," Selker says. "You can't just work in biology; that would never get you anywhere." His happiest moments in research, he says, have been sitting down with people who have ideas he never could have imagined, where he gets to push and prod, challenging them to figure out how to put those ideas to use. "So working across disciplines and personalities and in different perspectives; that's the good stuff for me. Now really that makes a great day." Selker is hopeful that the next clinical trial for GIK will take place by early next year, moving one step closer to a tested treatment that could save lives. The audio version of this story incorrectly states the time Harry Selker has been a physician as "nearly 50 years." He started practicing in 1979.